With an unusual method of ensuring pollination, Stylidium armeria earns itself the common name of Trigger Plant. The flower itself has a ‘Trigger’, when the pollinating insect touches the trigger, it springs forward and touches the insect. This both releases that plants pollen and removes pollen from other Trigger Plants. Over time the underground rhizomes will spread to form a small clump. In the garden this is a great plant for growing in a rock garden situation, in containers or in the general garden border. 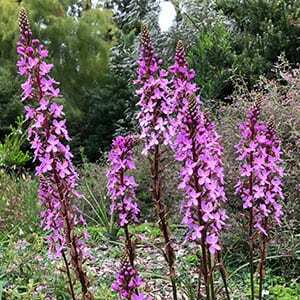 The pink flowers appear on tall stems above the grasslike foliage, with numerous flowers on each stem opening sequentially form the bottom upwards. In a moist yet well drained soil, and in a position in good morning sun with some afternoon shade in summer it is possible to grow Stylidium armeria and other species in the home garden. Many gardeners choose to grow these interesting plants in containers. Propagation is mainly from seed. Division of clumps is possible, however difficult to carry out successfully. Height – Around .2m to .9 metres. Spread – To around .2 metres as it forms a clump over time. Foliage – Mid green when in full growth. Drought tolerant – No, some moisture is required.